Weak, cracked & brittle nails indicate our overall inner health wellness. Low blood levels or anemia is the main cause of weakness, dry & brittle nails. Women are mostly affected by this problem than men. Because women mostly affected by anemia especially after deliver a baby. 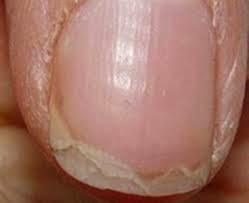 Non healthy diet, lack of vitamins, stress, thyroid, infections, skin problems, liver problem and some detergents can be the main causes of weak and brittle nails. At home mostly women have to work in a kitchen in frequent wetting like dish & cloth washing, in result your nails become very soft and weak. If your nails become cracked or dried use these effective home remedies for weak and brittle nails. Mix 1 tablespoon Garlic juice and ½ teaspoon Lemon juice. Apply Garlic Juice and Lemon juice on your nails daily for 45-50 minutes. It will make your nails strong and healthy. Make a smooth paste with 1 egg yolk, 1-2 tablespoons Aloe Vera and 1 teaspoon Honey. Apply it with a cotton ball or nail brush on your nails. Leave it for 1 hour and wash with Luke warm water. It will smooth your nail surface and keep your nails strong. Massage with Almond oil by using Lemon Peel off for rubbing. It will keep your nails healthy, pinkish color and strong. Mix 1 teaspoon Coconut Oil, 1 teaspoon Olive Oil in ½ Bowl Luke warm water. Dip your hand and feet in this water for 15-20 minutes. Dry up your nails with towel and apply petroleum jelly to nails. Mix 1-2 tablespoon Sea Salt, ½ Lemon Juice or 1 teaspoon vinegar in 1 glass of Cow Milk and dip your nails in it for 30-40 minutes. It will make your nails strong and keep your nails from breakage. Calcium in milk makes your nails strong naturally. Use it twice a week. Daily apply moisturizes your nails with vitamin E cream or you can use Almond oil or Olive oil for this. Use gloves while working in the kitchen or using strong chemicals at work place. Use health diet with Vitamin C, D, E, K, Iron, Folic Acid and Zinc for nails inner health. Fatty acids improve the nail texture and strengthen your nails. Drink a lot of water daily at least 8-10 glasses. Always use quality brands of nail polish and remover. Stop biting your nails. This habit makes your nails weak and brittle. Use nail polish remover only twice a week but not more than this. File and trim your nails regularly after manicure/pedicure when your nails dry.